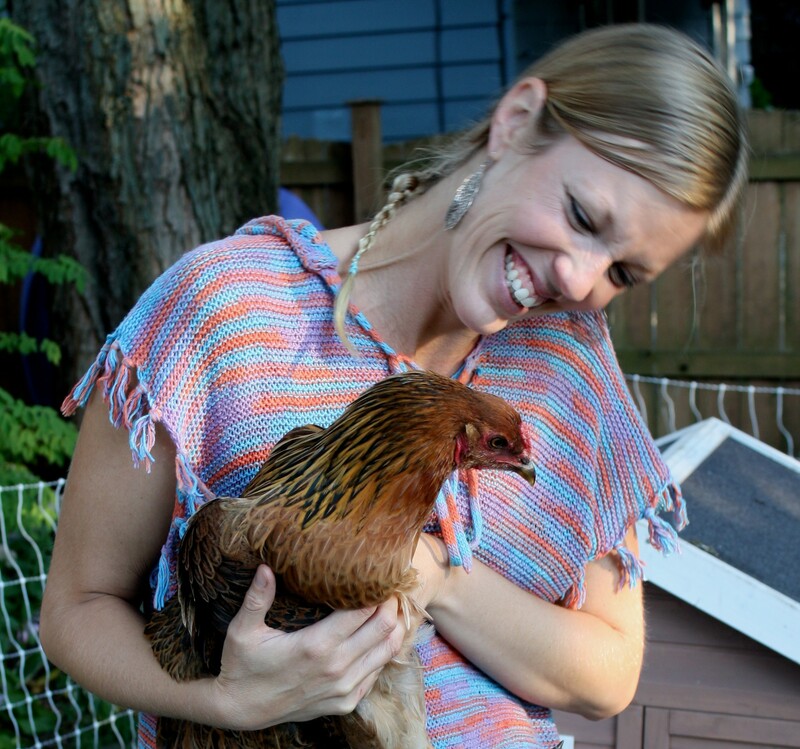 My name is Jaime Zanocco Fagan and I am a wife, mother, urban homesteader, and educator. My family and I live in the northern Illinois where we aim to live in harmony with God’s creation. To read a bit more about my most recent choice in returning to my blog, read here. Thank you for visiting Making of a Home! In May of 2010, I made the decision to take a step outside of the high school English classroom, which had been my profession for seven years, and stay home with my two little girls, ages five and two. At that time, I told people I wanted to be a stay-at-home mom. But shortly after I embarked on this new voyage, an image began to materialize in my mind when I thought of this word: stay-at-home mom. For some reason the only image that popped into my brain was that of a woman with perfectly manicured hair and nails, toting her kids off to the mall for the day. As I thought of this woman, and then looked at my own reflection in the mirror, I didn’t seem to fit into this mold. This thought began to make me feel as if I was on an island, with no one else like me. I didn’t seem to fit in with my stay-at-home counterparts I saw when I brought my girls to various classes and lessons around town. That’s when I started to ponder the difference between a stay-at-home mom and a homemaker. To me, a homemaker does just that, keeps the home. She does not cart her kids off from here to there and go the mall to get her nails done in between. She doesn’t swing through the closest fast food joint every evening so that the family can sit in front of the television sooner and catch up on their DVR recordings. A homemaker tends the home. She dotes on her children while doing the wash and then hanging it out to dry in the fresh clean air. She prepares three meals a day, from scratch, in her kitchen that is the centerpiece of the home. She tends to her garden, that which gives her family the sustenance they need to survive. She cans, freezes, and dries this garden bounty so her family has food to set aside for the winter months. She teaches her children by word and by deed to be kind, respectful, stewards of the earth. This has been the traditional role of the homemaker for generations, and this seems to fit more closely with the person that looks back upon me when I gaze into the mirror. I miss the writing that I use to do oh so much while I was a teacher, and my hope is to create a space where others like me can go for support, ideas and a little old fashioned camaraderie in this amazing journey of being a homemaker. You. Are. Amazing. I got chills reading this…and am SO proud of you!!!! What an example you have set for a TRUE mother. Thank you for your blog! I will be an avid follower!!!!!! Your ideals are an inspiration to those of us who feel that our values and traditions are being diluted by political correctness gone wild and a fast paced life style that thrives on instant gratification. As a child you think you have forever to enjoy life and to accomplish your dreams, but as we grow older and wiser we realize how short our lives truly are and we must cherish every moment. We need to make time to share the beauty of nature with our children and to relive our own childhood again through their tears, fears, joys and laughter! We need to share the traditions, values and views of our parents and grandparents which helped to formulate who we are today. We must provide leadership for our kids through positive example and help them aquire the “life skills” needed for the development of a sound value system. It is not only a gift from us, but our responsibility to them and it begins with getting back to the basics at home!! I’m so proud of you. You are such an inspiration to me and I think this is a great way for you to be an inspiration to many others. Love you tons!!! I as your mother am so proud of you! You are an inspiration to us all! You have chosen a great life and you will not regret this time with your girls…I know, to this day I do not regret my time with you and your sister! As I read your beautiful words I am so proud of what a wonderful woman,wife and mother you have become! Jaime had a wonderful set of parents for roll models in her daily life. You and John are a great example to your children and were always there for them. The circle of life. You realize, of course, that you come from hearty female stock: Great Grandmothers Mary Holdgrafer and Madeline Zanocco. Jaime!!! This is incredible!!! I was just talking the other day about what an amazing gardener you are and how you live this lifestyle with every fiber of your being! I am so proud of you and already can’t wait for your next post! I love you! I do not know how you find the time to do all you do! You have been a wonderful friend and a strong support in my life. I can’t wait to keep up with your blog. It will be my way to see what you are doing as if we were nearby. I look forward to raising our children together and you are an inspiration for me on the kind of mother that I want to be for Owen and the little one on the way. Jaime. omgosh. i am SO proud of you. You have captured something so magical in this new adventure ‘the making of a home’. Looking forward to continuing to lean on each other in our daily struggle to provide the lifestyle and love we desire for our children. i LOVE you. and am so thankful for you, Ty, Gianna and Addi. WOW!! This is truly amazing!! So glad your dad gave me your website to follow. I totally agree with all of the above comments. What a wonderful way to share your life experiences with others and what a fantastic way to bring up your two beautiful daughters. Thank you so much for sharing and I look forward to all of your upcoming inspirations!! What a great web site and blog. Thanks Jaime for sharing all your homemaking ideas with us. I love being a homemaker and that included all my time with my children. It is a tough job that requires creativity, patience, organization, along with lots of love and compassion. The saddest days of my life were when my kids went on to college and the days of being identified as a “stay at home mom” ended. I am so thankful to be a part of my granddaughter’s life and love being grandma because I was very fond of my own grandmother. She baked homemade cookies, pies and made homemade noodles. We played games like Spoons or Skit Skat. She always had a bowl of brightly colored M & M’s for us. No matter what life hands you, it is the memories of days spent doing things with your parents and grandparents that you will never forget. I remember I got a new stereo record player for 8th grade graduation and my parents and siblings would always dance to Beatle songs after dinner, while dad took pictures. God has blessed you with a great husband and two beautiful daughters, enjoy your time with them. It goes by fast. It’s easy to feel pressure to fit the “ladies-who-lunch” mould as a stay-at-home mum, I certainly feel it. . . . One of the great things about blogging is you realize that there are other women out there just like you, quietly tending to home, garden and family – no nail appointment necessary. It’s silly, but its a brave thing in this day and age to claim the title of Homemaker proudly – so kudos to you. Look forward to reading your blog. Thank you so much Stacey! And I couldn’t agree more…the community I have discovered since starting my blog has been amazing! It truly does make me feel better to know there are others out there like me. Thank you so very much Becky! I am very humbled. I read your post here and got chills, too. Well said!! I couldn’t agree more heartily! Oh, I can’t tell you how much I love this post. You have put the thoughts of my heart into words. I’m definitely on board with your thoughts on mothering. I’ll gladly join you in spirit! Thank you so much Sarah! It always does my soul good to know there are other mamas out there with similar thoughts and beliefs. Thank you for sharing!